Daddy's Blind Ambition: Almost here! Okay, you’re probably sick of hearing about spikes, but humor me one last time...at least for a while. Matt chose not to run on Wednesday because the rain was pretty intense. So track Wednesday became track Thursday this week. 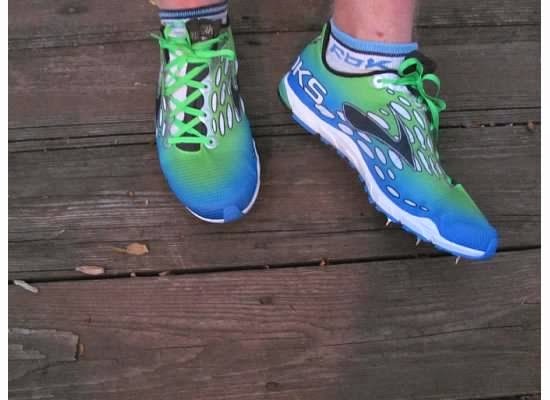 The girls were very interested in his new spikes and took turns running around the house in them (before Matt screwed in the spikes or else my floors would be a mess!). Running the loop from the stairs, through the dining room, the kitchen, and family room and back to the stairs is a nightly pre-bed activity, so why not do it in daddy’s new shoes?! Three weeks ago (on a very hot day) he did a time trial for the two events that he’ll run in Arizona next (the 1500 meter and the 5000 meter) and he ran a 5:08 and a 19:27, respectively. Last night he did the same workout and he’s already improved his time. 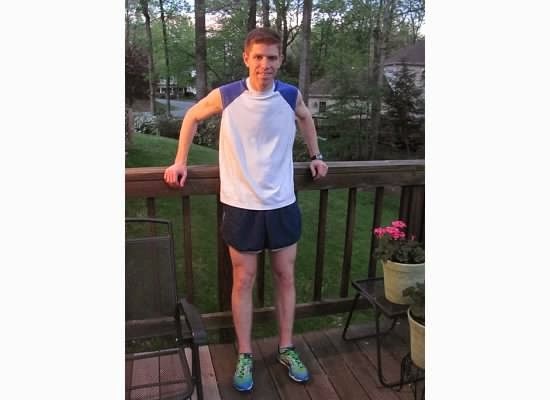 He ran the 1500 meter in 4:50 and the 5000 meter in 18:18. Was it the shoes? Probably not, but they sure are colorful, don’t you think? He took a ten minute break between the two events. Next week he’ll have two hours between events, thankfully, because it will be very hot (even if it is a dry heat!). When he got home I made him put his spikes back on so I could get a picture for you. I’m not sure he looks like he really ran both events and three additional miles to get to/from the track, do you?